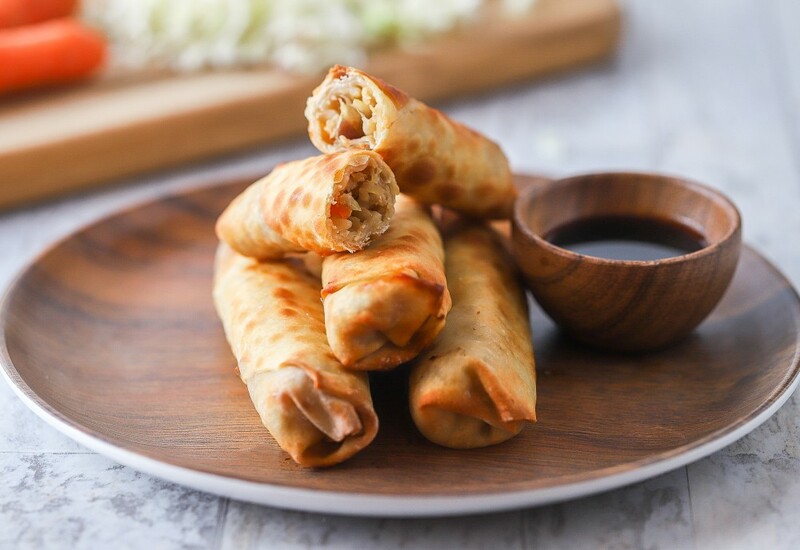 Crispy spring rolls filled with perfectly seasoned sautéed vegetables are super easy to make in the air fryer. These little bites of goodness go well for happy hour or as an appetizer. Serve immediately with your favorite dipping sauce and refreshing beverage. Heat sesame oil in a skillet over medium-high heat and cook garlic until fragrant, about 30 seconds. Add cabbage, carrots, and bamboo shoots to garlic and cook until slightly tender, about 5 minutes. Remove skillet from heat and stir lime juice, fish sauce, and soy sauce into vegetable mixture. Fill each spring roll wrapper with vegetable mixture, placing the filling just below the center of the wrapper. Fold the bottom point over the filling and tuck under. Fold in both sides and roll up tightly. Use water to seal the wrapper. Repeat with remaining vegetable mixture and wrappers. Spray air fryer basket with cooking spray. Place spring rolls into basket and spray rolls with cooking spray. Cook spring rolls in air fryer for 5 minutes; turn over and cook until evenly browned, about 5 minutes more. Skip the fish sauce for a vegetarian version. Or cook ground pork with the garlic until browned if you want to add some protein to the spring rolls. Per Serving: 97 calories; 4g fat; 14.6g carbohydrates; 2g protein; 0mg cholesterol; 174mg sodium. Love these spring rolls because they are crunchy and not greasy at all! I used tamarin instead of fish sauce and soy sauce, and was happy with the flavors. Don't think I will ever deep fry springs rolls or egg rolls ever again. Crunchy and delicious! Perfect to serve with chicken pad Thai for an Asian-themed dinner. I grabbed a bag of preshedded carrot and cabbage mixture to save time. Loved it. These spring rolls were amazing. I made them to go with vegetable fried rice and my wife absolutely loved them. Simple ingredients and easy recipe to follow. Keep them coming! !